Nautical or Beach is one of the most popular themes for a bathroom which is adored by many homeowners. Such look never loses its throne from the top list of admirable bathroom decoration. 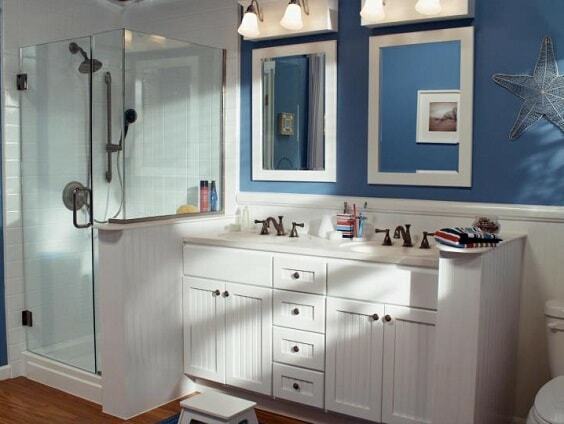 It’s so understandable since nautical theme can create a refreshing and joyful atmosphere around the bathroom. 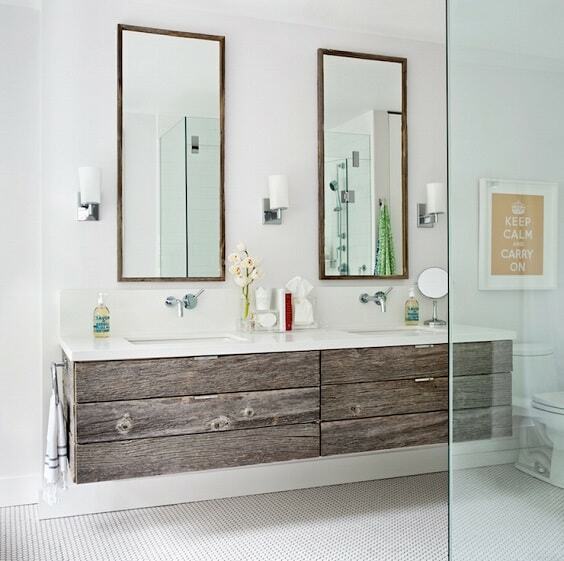 There is noA�doubt that you’ll have a beautifully inviting bathroom once you go with the nautical-themed decor. 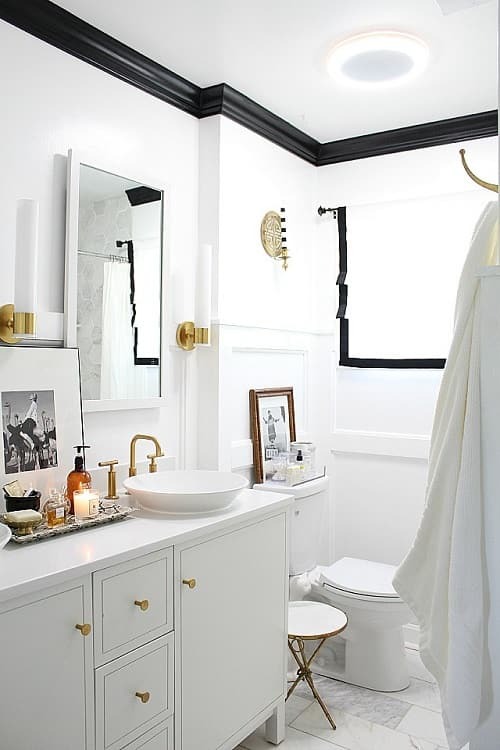 Of course, you will need some nautical or beach-themed bathroom accessories to create such look. Luckily, you can find lots of tempting product to buy in some marketplaces to have your dream nautical bathroom. However, it can be confusing too, in which you have to choose the best products to purchase. Because it’s not only about the beauty, but also, the bathroom set should be durable to deal with bathroom condition and reliable to use daily. Here, we have picked some worth-to-buy seashell bathroom set products which are not only admirable but also durable and reliable at the same time. You can find those products on Amazon which we have picked based on their quality and customer reviews. 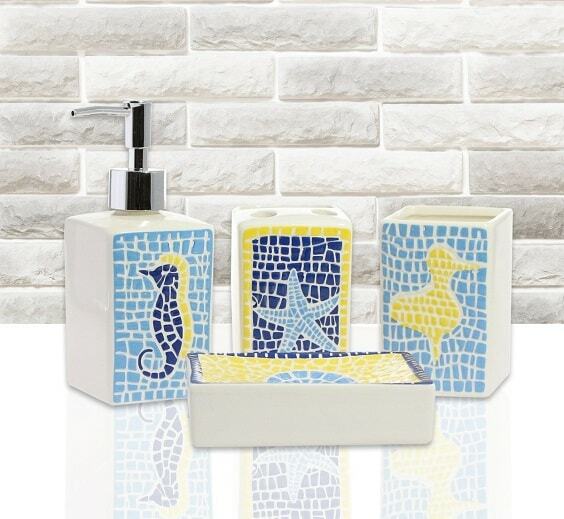 Our pick of seashell bathroom set will never fail to give your bathroom a gorgeous nautical touch. Then, they also very convenient to use every single day that will last for years. A beautiful seashell bathroom set in bright white overall look which will beautify your bathroom decor stylishly. It comes with a catchy seashell and starfish pattern in black and brown, creating a calming yet decorative look. The set is made of high-quality ceramic which feels durable enough at the first touch. Its sturdy construction is totally well-made. TheA�4-Piece Ceramic Bathroom Set by JustNile is offered at $27.99 which includes a soap dish, lotion dispenser, toothbrush holder, and tumbler. 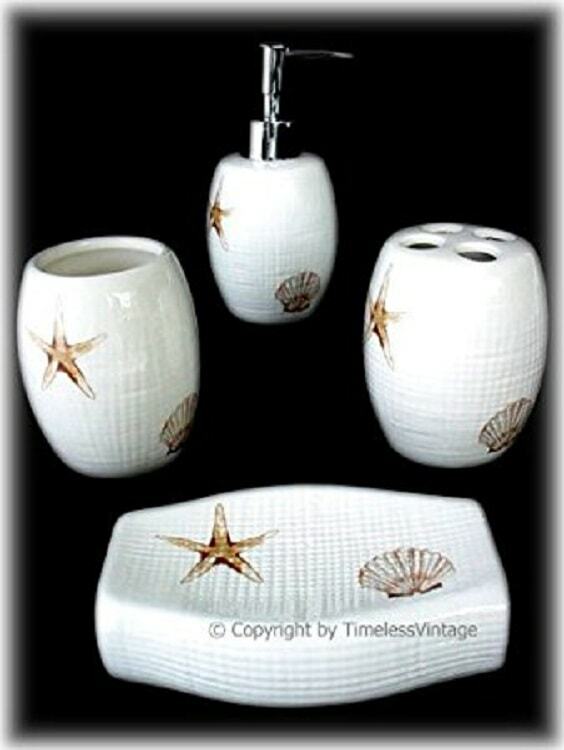 This one is a dazzling seashell bathroom set which will enhance the beauty of your bathroom decor perfectly. Its textured transparent body is decorated with the accent of seashells and starfishes in beige and orange which gorgeously colorize it. The set is made of high-quality acrylic which is scratch resistant and sturdy enough to last for years. Each set is also accented with durable chrome ring which doesn’t only make it more attractive but convenient to use. 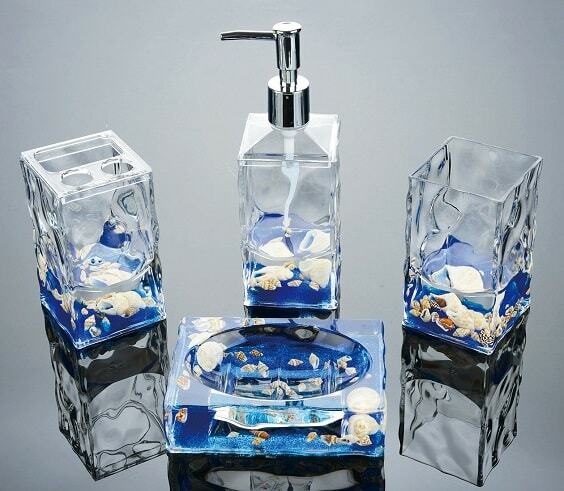 The set includes one soap dish, soap dispenser, toothbrushA�holder, and two tumblers. You can find theA�5-Piece Seashell Ocean Beach Bathroom Set by AMC at Amazon with $26.99 price tag. 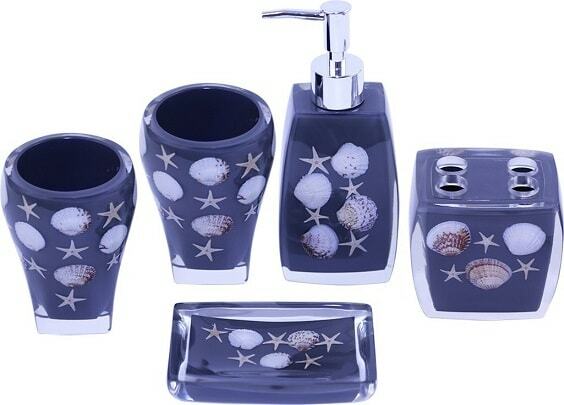 The catchy seashell bathroom set which will surely add another style to your bathroom decor. It comes with a seashell-shaped lotion dispenser, scallop-shaped toothbrush holder, and two tumblers with the sea-horse 3D picture. 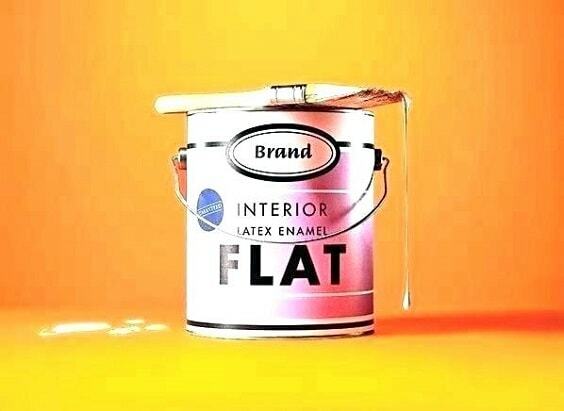 The product is made of high-quality resin which is very sturdy, so it will stay and look well for years. You will not have to worry about cracking or chipping. TheA�Beach Seashell Bathroom Accessory by Hotsan is sold at $33.99 which includes a lotion dispenser, soap dish, toothbrush holder, and two tumblers. Another recommended product by HotSan which is designed in a more attractive look. The body is still made in transparent style but enhanced with blue finish and black seashell accent. The resin material of the set is so satisfying to use lastly. It’s also environmentally friendly, so you don’t have to worry about its safety. TheA�5-Piece Beach Seashell Bathroom Accessory by Hotsan, Blue is available on Amazon which is offered at $37.99. 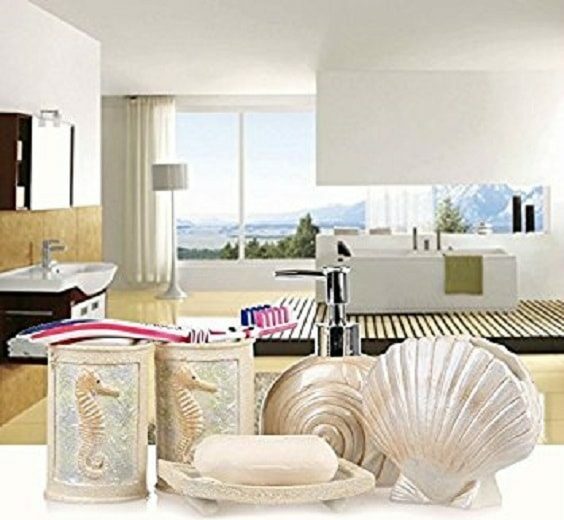 Such a very reasonable price for a luxurious seashell bathroom set which includes a soap dish, lotion dispenser, toothbrush holder, and two tumblers. The uniquely stunning seashell bathroom set which will bring the style of your bathroom decor to a whole new level. Inside its transparent acrylic body, the real seashells are floating on the blue oil, perfect for a nautical bathroom decor. Its acrylic construction is surely sturdy, making it convenient to use and durable to last for years. The body is designed with an anti-leaking procedure which prevents the oil from spilling very well. TheA�4-Piece Liquid 3D Floating Motion Bathroom Accessory Set by Yeti Decor is offered at $24.99. The package includes a soap dish, lotion dispenser, toothbrush holder, and tumbler. This one is a cute seashell bathroom set in a glossy gray finish with seashell and starfish sequence in white. The combination creates a catchy look which is perfect for a minimalist bathroom decor. The product is handmade from high-quality ceramic which is durable and reliable. Its finish looks so shining to cheer up the atmosphere of your bathroom. Available on Amazon, theA�5-Piece Gray Bathroom Set Beach Style by ChabaLine is offered at $39.99. The set includes a soap dish, lotion dispenser, toothbrush holder, and two tumblers. The stunningly elegant seashell bathroom set for you who love to add something glamorous to the room’s decor. It comes with the real seashell cover which looks dazzlingly beautiful in a more natural way. Then, its seashell look is combined with the chrome-finished resin which matches the style perfectly. The set looks so shining to brighten up your bathroom decor gorgeously. Moreover, such materials combination makes the set feels so sturdy and durable. 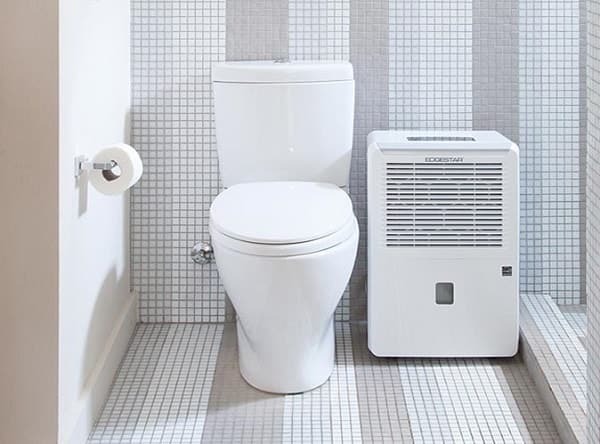 It can cope with the damp condition of the bathroom very well. 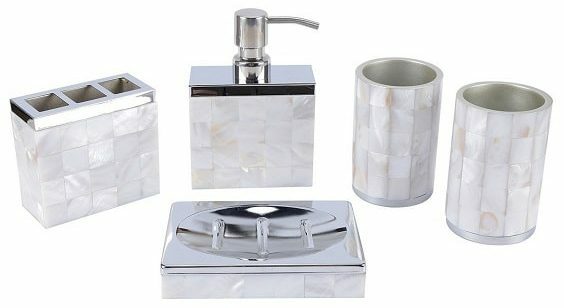 The stylishA�5-Piece Bathroom Accessory Set Natural Mother of Pearl Style by Aimone is available on Amazon with $42.99 price tag. You will get a soap dish, lotion dispenser, toothbrush holder, and two tumblers. This one is surely a beautiful seashell bathroom set in colorful look which will give a superb stylish touch to the room’s decor. The body is made of transparent acrylic with the floating seashell, flowers, stones, and leaves inside. The acrylic material of its construction is not disappointing at all. It feels so sturdy that tells its great durability. Find the stunning 4-PieceA�Ocean Series Bathroom Organizer Set by EUMAT on Amazon which is offered at $36.99. The package includes 1 soap dish, 1 lotion dispenser, 1 tumbler, and 1 toothbrush holder. 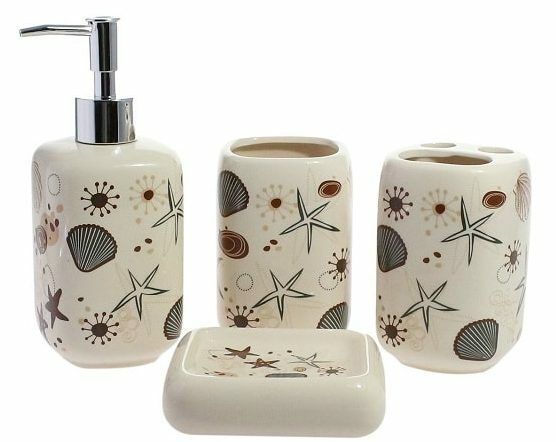 The adorable seashell bathroom set in simple design which is worth to complete your bathroom decor. It comes with a rounded design with weave off-white surface and nautical painting. The material that builds up the construction is great ceramic which ensures its quality. It doesn’t feel cheap at all which makes it durable enough. You can find theA�4-Piece Seashell Nautical Bathroom Accessory Set by American Chateau on Amazon which is offered at $24.99. If you are looking for a much cuter seashell bathroom set, this product should be one of your top choices. It comes with a cheerful design which looks so catchy to another style to your bathroom decor. The dispenser and soap dish are designed in oyster shape, the tumblers are accented with 3D engraved beach stuff and seashells, and the toothbrush holder is uniquely made in an umbrella shape. 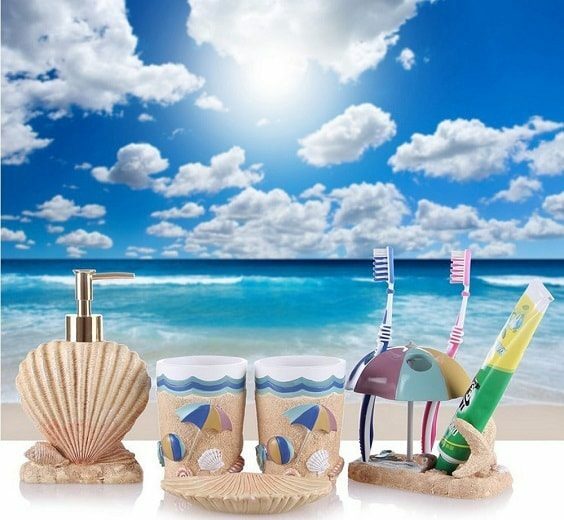 With such look, this seashell bathroom set will create a playful atmosphere in your bathroom. Each of the set is handcrafted from high-quality resin which is durable and easy to take care. It doesn’t feel cheap and environmentally friendly too. 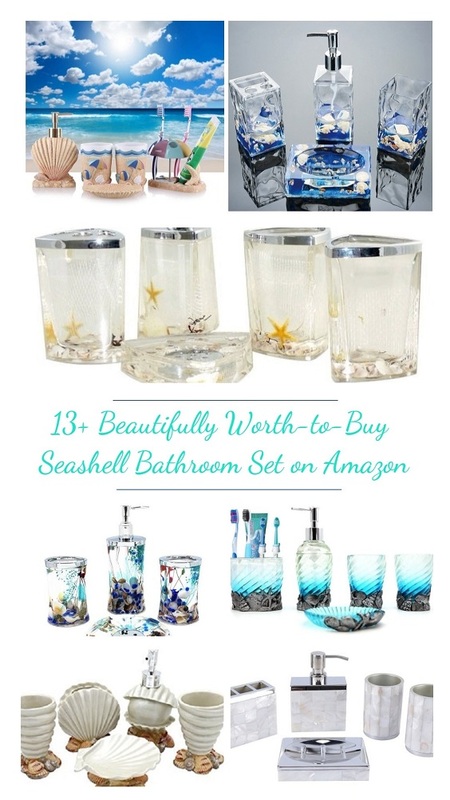 You can find theA�5-Piece Seashell Bathroom Accessories by wonbye on Amazon with $48.99 price tag. 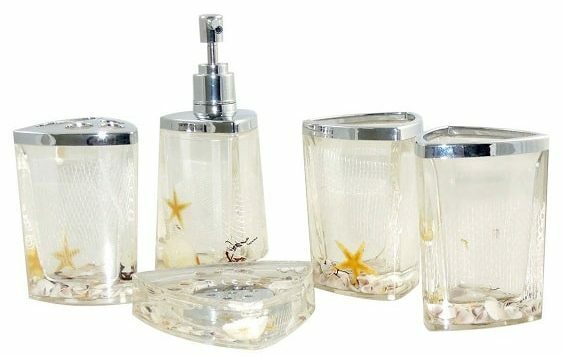 It’s a very reasonable price for a unique seashell bathroom set which includes 1 soap dish, 1 toothbrush holder, 1 lotion dispenser, and 2 tumblers. Blue is always a good idea when it comes to a nautical-themed bathroom, it’s actually an ultimate choice that you have to consider. This one is a beautiful seashell bathroom set in such finish which youA�have to purchase. It comes with the seashells and mini starfishes accent which makes it look cutely attractive. The surface is covered with transparent acrylic, it’s so beautiful. TheA�5-Piece Bathroom Accessory Set, Ocean Series by JynXos is offered at Amazon with $59.99. The set includes 1 soap dish, 1 lotion dispenser, 1 toothbrush, and 2 tumblers. Another colorful seashell bathroom set in colorful look which will cheer up the nuance of your bathroom beautifully. The design is so attractive,A�with sea animal painting in tile background. The texture resembles the look of seashell mosaic which looks so catchy. It comes with a dazzling color combination of shades of blue, yellow, and white which you will surely love. The ceramic construction of this set will not disappoint you at all. 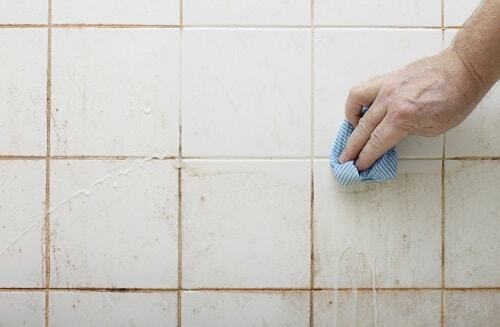 It will look dazzlingly colorful for years to complete your bathroom decor. Available on Amazon, the 4-Piece Bathroom Accessory Set Sea Animal Tiles by JustNile is sold at $32.99. The package includes a soap dish, lotion dispenser, tumbler, toothbrush holder. 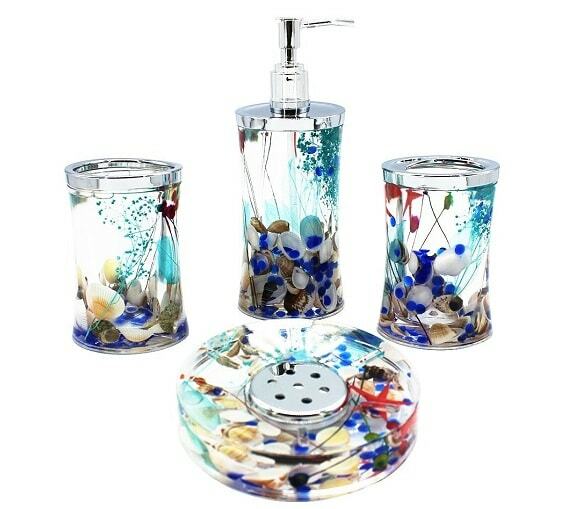 The beautiful seashell bathroom set which will perfectly enhance the beauty of your bathroom decor. It comes in a very stunning seashell shape that is so tempting to buy. The toothbrush holder and soap dish are designed in oyster shape, the tumblers are in cylinder seashell, and the dispenser is the unique one with the huge pearl design and oyster design. For the base, the starfish and seashell accent in brown and red are also added. The material that builds up the product is high-quality resin. You can guess how durable this set is at the first touch. 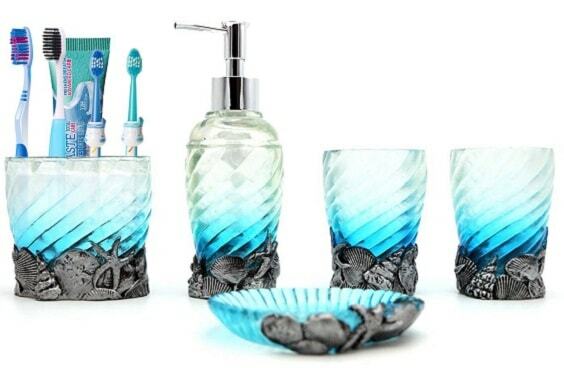 You can purchase theA�5-Piece Bathroom Accessory Set Cinch and Seashell Design by spending $59.99 (on sale). The package includes 1 soap dish, 1 lotion dispenser, 1 toothbrush holder, and 2 tumblers. 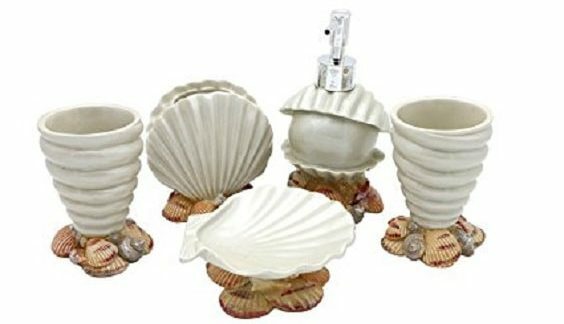 The simply adorable seashell bathroom set which is perfect for a woman’s bathroom. 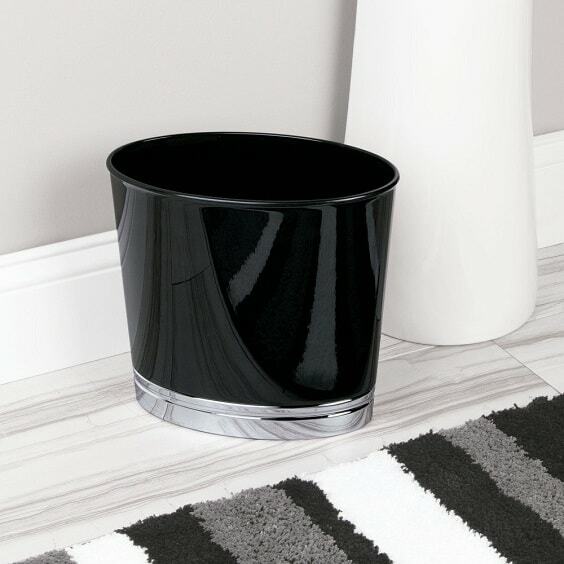 It comes in a simple design and mesmerizing purple finish to add beauty to your bathroom decor. 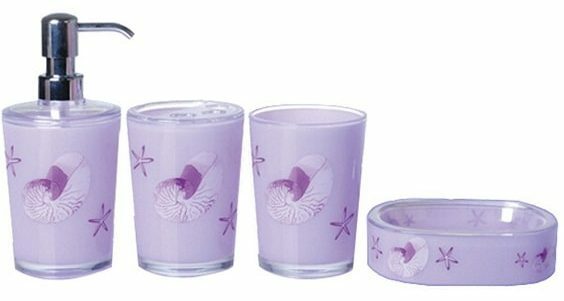 The white starfish and seashell pattern of this set matches very well with its soft purple background. It can be a great choice for you who want a bathroom set with a soothing color. Its acrylic material doesn’t feel cheap at all, so you don’t have to worry about its durability. The set is also very easy to clean with just a little bit of wiping up. 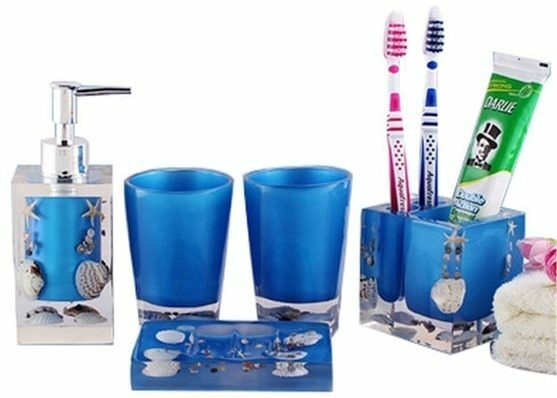 Get theA�4-Piece Bathroom Accessory Set, Purple Starfish and Seashell Design on Amazon with $32.99. You will get 1 soap dish, 1 lotion dispenser, 1 tumbler, and 1 toothbrush holder. So those are some seashell bathroom set which you can include to your shopping list. They are available on Amazon and offered at very affordable prices. 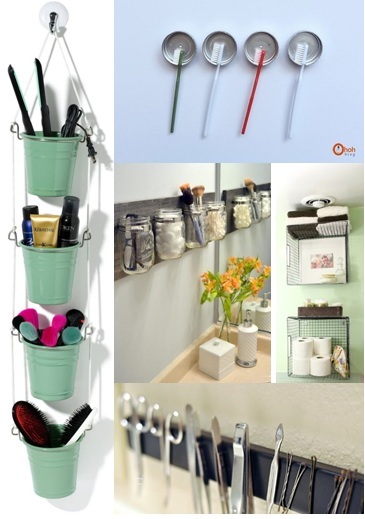 But, their quality is not disappointing at all to become the reliable and durable companion of your bathroom stuff. The designs of those sets are also very beautiful to add a stylish touch to your bathroom decor. 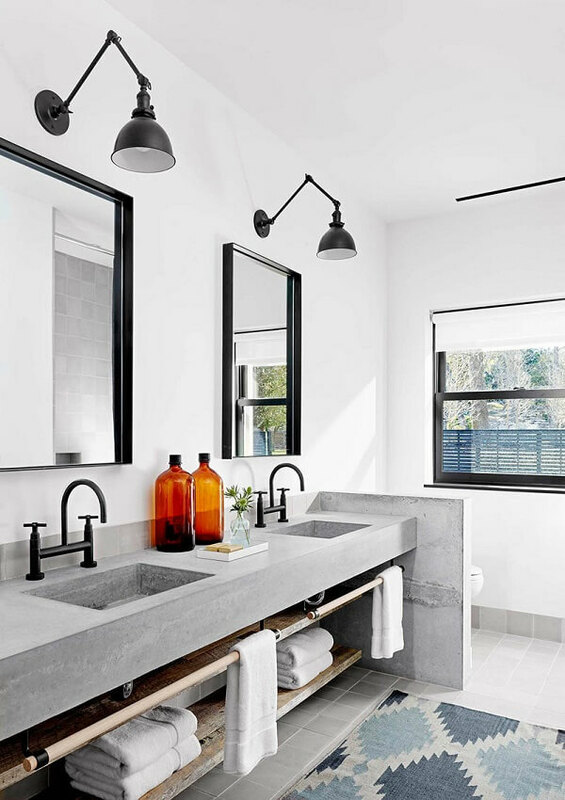 You just have to choose the one that suits the overall look of your bathroom so you can get a catchy harmonious look. It will make your bathroom activity feels more exhilarating and also amazes all the coming guests. Choosing seashell bathroom set is surely a great idea if you want to have a mesmerizing nautical-themed bathroom. They will surely match the nautical theme very well and make the room look so stylish. Furthermore, keep in mind to choose the seashell bathroom set which is not only adorable to look at, but also reliable to use daily and durable to last for years. The material’s quality will determine how well the product is. 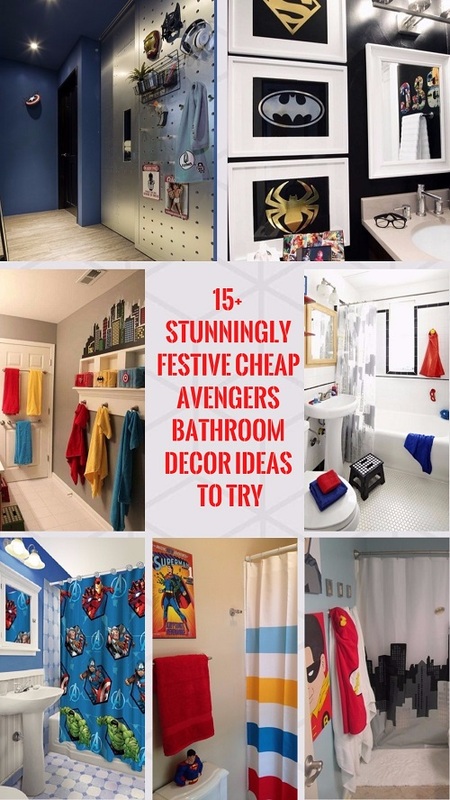 Well, happy remodeling your bathroom decor then!